Work on both the satire and the fiction of the English eighteenth century has tended to focus on the transition from a patrician culture to a culture dominated by the logic of the market. 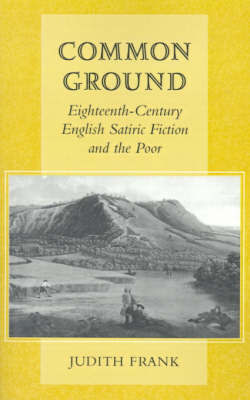 This book shifts the focus from the struggle between aristocratic and bourgeois values to another set of important, yet usually unremarked, class relations: those between the gentle classes and the poor.The author reads four eighteenth-century satiric novels-Henry Fielding's Joseph Andrews, Laurence Sterne's A Sentimental Journey, Tobias Smollett's Humphrey Clinker, and Frances Burney's Cecilia-"from below," exploring the ways in which the gentle authors' experiences of the poor shape the novels both thematically and formally. The author argues that in these novels the mental structures of gentlemen and gentlewomen characters are formed through acts of imitation of and identification with the poor.The four novels all concern, in varying degrees of explicitness, the ways the poor were despised and denied politically and socially: the curtailing of popular festivity, the shift from a paternalist to a contractual model of service, the social dislocations caused by enclosure, and the commodification of labor. In the novels' representations of gentle consciousness, the author suggests, the gentry mimic and identify with the socially marginal, their imaginary repertoires formed out of such identification.Claiming that affect is formed in the interrelation of social groups as they react to economic change, this book centers on the conjunction of economic change, novelistic technique, and the constitution of affects. Further, it suggests that satire-which, during this period, was falling into disrepute under the pressure of contemporary attempts to redefine comedy-may be regarded as a generic form that arrests affect, refusing to idealize or cover over the devastating social effects of economic "progress," but at the same time unable to see and say what has been lost. The satiric element in these novels is the moment where anxiety about the gentry's relation to the poor-and hence the gentry's very self-definition-is most richly performed and ritualized.